Strong middle distance prospect who will use the fall to build his base for the track seasons…was a standout athlete at St. Thomas Aquinas, where he transitioned from football and baseball to a full-time runner….versatile enough to contribute on 4×400 when called upon. 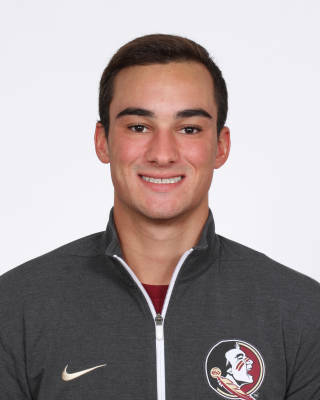 Cross Country: Built his training base throughout the cross country season in preparation for the 800 on the track…finished 33rd in his first collegiate cross country meet at the 8k FSU Invitational (28:16.7).Indoor: Ran the 800 leg of sixth-place ACC Championships DMR that recorded the No. 3 time (9:45.56) in program history…posted a PR in the indoor 800 at the Tyson Invitational (1:53.92)…competed in three other meets. Outdoor: Highlight of the season came at the Seminole Invitational where he shattered his 800 personal-best by nearly three seconds (1:51.01)…competed in seven meets…breakthrough came in fourth-place finish at Rafer Johnson/Jackie Joyner-Kersee Invitational with PB 1:51.88. Cross Country: Trained throughout the season in preparation for the track season while taking a redshirt. Indoor: Competed in four meets, predominantly in his specialty, the 800…posted his season-best in the 800 at Kentucky’s Rod McCravy Memorial (1:53.93)…made his indoor debut in Birmingham, Ala. at the Auburn Invitational, competing in the 800 and on the 4×400 relay…ran the 800 leg on the sixth-place DMR at the Razorback Invitational. Outdoor: Sat out the season as a redshirt, competing only unattached at home. Set school records at St. Thomas Aquinas in the 800 (1:52.3), 1600 (4:22) and as a member of the 4×800 (7:51)…three-year team captain in cross country and track & field…contributed to 2013 4A state cross country and 2014 4A state track & field team titles…a two-time All-Broward County selection in both cross country and track…strong student who was on the President’s Honor Roll in 2014…winner of the school’s Larry Davis Scholarship…active in multiple community service endeavors…sister Trish ran on the FSU cross country and track teams for two seasons…mother Trish, who was his high school coach, ran for NC State’s 1980 national championship cross country team…majoring in criminology…born Dec. 22, 1995.